*Adopts pole changeable 2 steps speed motor to drive for large volumn material mixing, also can use stepless, variable speed motor with inverter for different speed adjustment with different material characters. *Cover is equipped with attachments for feed mixing with liquid or powder form(upon request). *The machine is mainly using for blending dry PVC with rigid or Thermoable poly plastics, ABS, PP, PE, Pigments,… etc, are also applicable. PVC Pelletizing Machine & Masterbatch Pelletizing Plant. 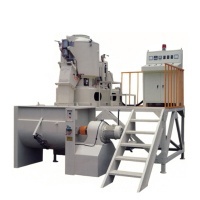 Nylon & Compound Plastic Pelletizing Extruding Machine. PE, PP Molding Head Pelletizing Cutting Palletizing Extruding machine. Whole Plant Equipments for Plastic Reformide Foam Pelletizing Machine. PVC Rigid Pipe Making machine, PVC Profile Extrusion. PVC Soft Profile Extruder(garden horse) and PVC Reinforced Hose Making Machine.